"How to back up your PC and laptop on system shutdown"
This article covers the benefits of making backup copies before computer shutdown. It describes two ways of implementing such security, with the main emphasis on backing up a computer automatically upon system shutdown. Frequently, computer failures resulting in data loss occur when shutting the computer on or off. The best safeguard against this would be to back up data immediately after finishing work on the computer, before it is shut down. But planning such backup using a fixed schedule can be difficult to implement. It is often difficult to determine when a user will finish work, and users aren’t very keen on waiting for backup to be completed - they just want to shut their computer off and get going. There are two solutions to this problem. One involves the user not shutting the computer down at all after finishing work. Backup is performed at a set time, after which the computer is automatically shut down by means of a shutdown instruction. This solution, however, cannot always be used, e.g., due to the rules in force in a company ordering employees to unplug their computer after work. The second solution, which will be described in detail, involves using the backup on system shutdown function built into the Ferro Backup System. This function causes the backup task to be started automatically, at the moment the user presses the power button the computer housing or selects the system shutdown command. The backup process begins when the system completes all login sessions. During backup, a message is displayed on the computer screen showing backup progress. At that time it is not possible to log in again to the system. If the administrator has activated the Back up before system shutdown option on the FBS Server console, however, the user may interrupt the backup and immediately shut the computer down. After completion of the backup, the operating system shutdown continues, and the computer is then shut down. The administrator can choose which backup tasks are to be performed in this way, and which should be performed only according to a schedule or on demand. What is more, the program can be configured such that backup on system shutdown is performed only when the backup planned for a given day according to the schedule has not yet been made. This is a good solution when we want to perform the backup at a strictly defined moment of the day but, as sometimes happens, a user finishes work early. In such situations, using the traditional backup solution based only on a schedule, that computer would remain unsecured until the next time it was started. Using backup on system shutdown, the same computer is secured even if some unforeseen event requiring early shutdown occurs. Click on the command "Modify value data" in the "Edit menu"
and enter 14400000 (in decimals). Restart the computer so the change takes effect. Note. In Windows 8 and newer the operating system is (by default) hibernated rather than shut down. In order to enable backup at shutdown turn off Fast Startup. This key should also be manually changes in another situation. Some security programs monitor the state of the system register and automatically reset the default values. Such a change means that backup will be interrupted after about three minutes. The solution to this problem is to configure the security program appropriately and manually adjust the above-mentioned registry key, or speed up the backup so that it finished within the default time period. Increasing backup speed can be achieved by using delta backup, restricting the scope of the backup, or following the tips described in the article Maximum Backup Server Performance. Note. While using the ESET Nod32 antivirus software backup may be stopped after approximately 10 minutes. To resolve that problem add FBSWorker.exe to the exclusion list in the Host Intrusion Prevention System (HIPS). 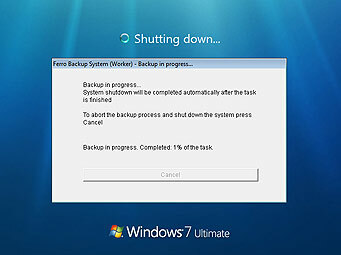 Automatic backup on computer shutdown is particularly useful in companies with an irregular work cycle, where it is difficult to plan in advance a suitable time for performing backups. This solution also proves itself when we want to be sure that a computer will be secured each day but we don’t want to perform backup during office hours because this could increase the load on the computer network and possibly disrupt employees in the performance of their duties.